It was a long road to stardom for Gannon. 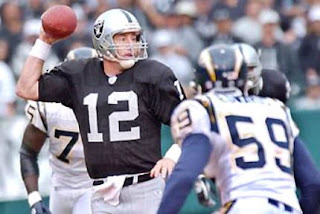 Quarterback in a wing-T offense in college, Gannon was taken in the 4th round of the 1987 NFL draft by the New England Patriots, who wanted to convert him into a running back. Unwilling to make the change, he was traded to Minnesota and sat on the bench for three years, throwing a total of 21 passes. Finally getting an opportunity to start in 1990, Gannon had limited success and was allowed to depart as a free agent following the ’92 season. He was a backup with the Redskins in 1993, missed all of ’94 due to a rotator cuff injury, and moved on to Kansas City, where he was a backup for four years and saw his most significant action in his last year with the club in 1998. Signed as a free agent by Oakland in ’99, Gannon finally blossomed as he ran Head Coach Jon Gruden’s version of the West Coast offense, passing for 3840 yards and 24 TDs and gaining selection to the Pro Bowl. He had an even better year in 2000, gaining consensus first-team All-NFL as well as Pro Bowl recognition and winning the Bert Bell Award as NFL Player of the Year. Gannon had a third straight Pro Bowl season in 2001, throwing for 3828 yards and 27 TDs against just 9 interceptions, and thus leading the NFL with a 1.6 INT percentage. Raiders went 11-5 to finish first in the AFC West and gain the top playoff seed in the conference while leading the NFL in total offense (6237 yards) and passing offense (4475 yards). Won AFC Divisional playoff over New York Jets (30-10) and AFC Championship over Tennessee Titans (41-24). Lost Super Bowl to Tampa Bay Buccaneers (48-21). Injuries curtailed Gannon’s 2003 season and he appeared in a total of just 10 games in ’03 and ’04, after which he retired. A fiery leader and precision passer, he ended up throwing for 28,743 yards and 180 TDs with 104 interceptions, and ranked in the Top 20 all-time at the end of his career with a passer rating of 84.7.